The latest techradar survey has poked into our daily gadget lives and found the truth behind our technology-based lusts. The big news is that if you thought we were all losing interest in tablets, you'd be wrong: a third of us are looking to upgrade their digi-slate in the coming months. We surveyed 3,563 people and 34% of those who owned tablets said they were ready to replace it within the next year. But it's also less than a quarter of people's favourite mobile computing devices – 43% of people prefer to use their mobile phone to browse the internet. Laptops are preferred by 29% of our readers. Apple once again looks like it's going to win this Christmas, in gadget terms, with the top three most desired tech gifts in the list being products from the company. Both the iPhone 6S and iPhone 6S Plus took first (we bundled those in together) whilst the unreleased iPad Pro came in second place and the Apple Mac computer came in third. The rest of the list also featured the Apple Watch in sixth while the Samsung Galaxy S6 and S6 Edge came in eighth place - and the new range of 4K TVs are showing strongly with loads of us still hankering after the next-gen sets. 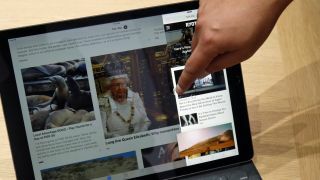 Patrick Goss, editor in chief of techradar said: "I think it's genuinely fascinating to get a glimpse into our readers' wish lists at this time of year, and it's pretty clear that tablets are going to sell like hot cakes in the next couple of months. "Apple products featuring so highly will surprise precisely nobody, but 4K televisions are clearly going to increase our New Year's resolution (sorry)."